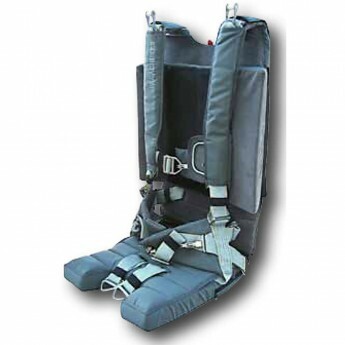 Strong L-39 Chair Emergency Pilot Rig is available at Rock Sky Market. L-39 Chair is designed exclusively for the L-39 Albatross. Please contact us for current stock and custom production times. The design incorporates existing Russian designed pilot restraint system found on the original assembly, including shoulder roller guide for inertial reel and seat belt buckles at the hips. This provides you with fit-and-fly technology that perfectly replaces the original equipment and gives you peace of mind knowing that you have a comfortable, top of the line system. The Model L-39 Chair, measures 27" (68.6 cm) tall by 17" (43.2 cm) wide by 3.5" (8.9 cm) thick and weighs approximately 25.9 lb. (11.7 kg).